Rejuvenating my energy will require me to find, embrace, and savor the calm when it presents itself. Today calm found its way to me through cake. 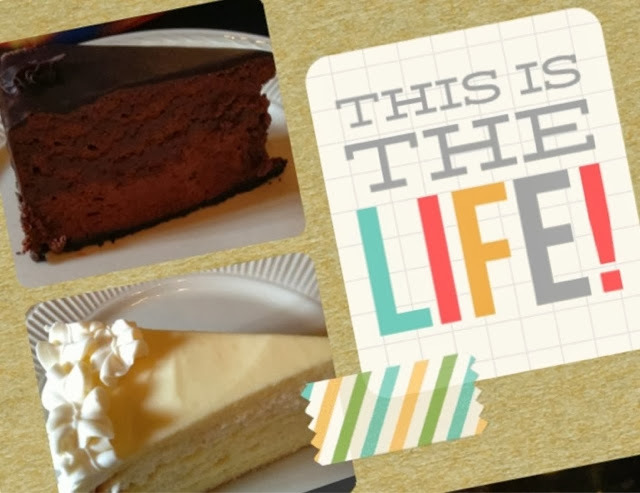 Deliciously dense chocolate heaven and elegant lemon chiffon. Something so simple provided a brief moment of calm celebration, rejuvenating my mood and ENERGY. ***Inspired by #edugood, January Day 2: calm. Thinking about the year ahead connected me with many potential words to guide me through: ASPIRE, ACCOMPLISH, BALANCE, ENERGY, IMAGINE... I was in search of a word that would push me through my current and new commitments & goals. I wanted a word that would help me to focus on the positive and 'choose happy.' But I also wanted a word that would extend my journey set forth by INSPIRE (2012) & BELIEVE (2013). As the New Year approached, ENERGY was the word clearly calling my name... Aspiring towards my goals to accomplish in the new year would require an abundance of ENERGY. Balancing my family's daily schedule and calendar with fun and relaxation would demand a strategic use of ENERGY. Above all, though, focusing on ENERGY would help me to develop a routine of healthy choices and positive mindset, allowing me to continue recognizing and sharing INSPIRATION while BELIEVING all things are possible. I will be aware of the fuel I need to recharge my body and mind with necessary ENERGY. I will strategically use my ENERGY to ensure I maintain my focus and accomplish my goals. I will be mindful of the ENERGY I bring into the spaces I enter. 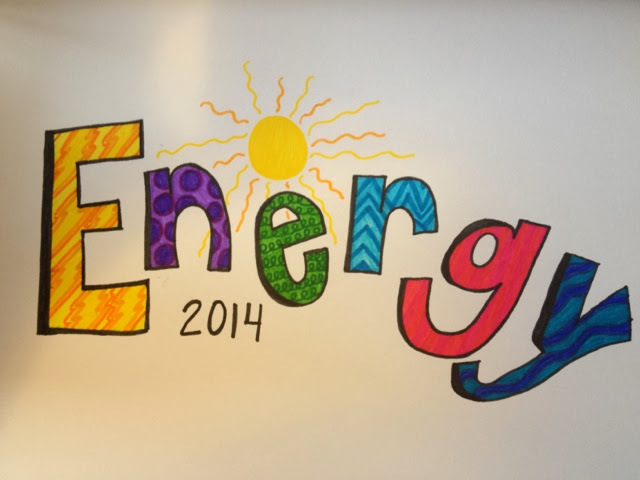 I am confident ENERGY will provide me with the surge I need for 2014. Another year with a single word by my side. I still am amazed at how "one-little-word" can have such a positive, dynamic impact on a person. I will always be grateful that Ann encouraged me to simplify my new years' goals to a word providing direction rather than another list of "to-dos". For the past year, BELIEVE has been my simplified goal. A word that inspired me to read a favorite series with my daughter believing there is always time for sharing favorite books (in which we tracked 28 shared together this year)! A word that helped me to conquer my book gaps, bringing more variety into my literate life with a focus on language, genres, and closely reading with deep purpose. A word that gave me the strength to keep my running stamina throughout the entire year, believing this consistent exercise to be the key factor in my positive mood, focus, and thinking. A word that helped me to provided support to my family and friends as they embarked on personal change and challenges, believing that everything happens for a reason and will make us stronger together. A word that kept me believing in the #edugood around me, helping me to advocate for and believe in practices that support the empowerment of students and their voice. A word that provided me with the encouragement to challenge myself with new possibilities, believing that whatever is meant to be will be but we must not close our own doors. A word that simply gave me the strength to be me and believe in myself. BELIEVE provided an inspirational learning journey in 2013, proving that INSPIRE would always be a part of my mindset, my goals, my character. Even though INSPIRE was my word for 2012, it always remains close by my side. In 2013 INSPIRE connected me to great books, helped me find enjoyment in the weather of the season, unveiled ways to share inspiration with others, kept me attentive to student voice, shined itself on new opportunities, and led me to quotes that kept me going. Choosing a one-little-word for the upcoming year is more to me than just choosing a goal or resolution. It will be a word that provides a springboard into the future; a word that will allow me to be more intentional about my current goals while providing a vision for longterm goals. So as I leap into a new year with profound ENERGY, I know my words of the past will continue to support me and compliment my new word and personal goals. 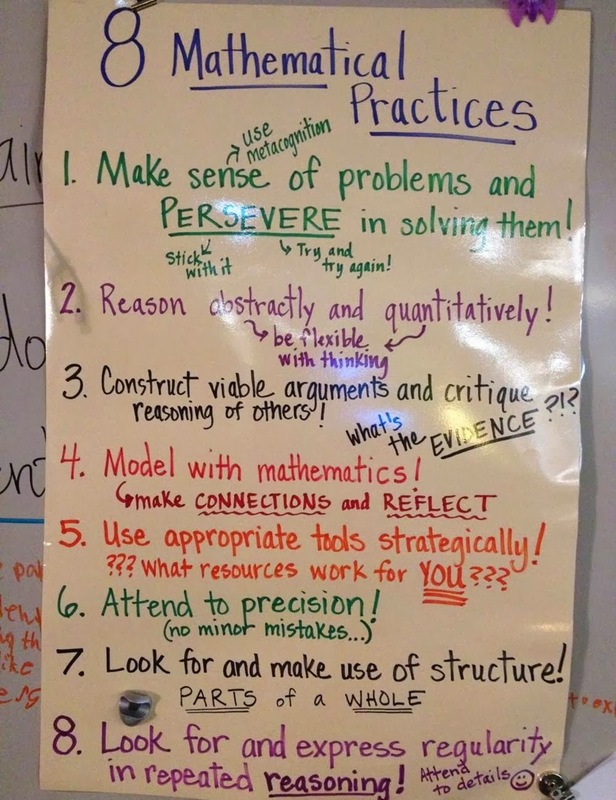 Our Classroom Poster of the 8 Mathematical Practices! Last spring I had the chance to gain a different perspective of our classroom, seeing it in action, not as the teacher who needs to make sure that engagement is high and problems are appropriately challenging, but as an outside observer. What I noticed amazed me and had me thinking and reflecting on what THINKING MATHEMATICALLY means in the new day and age of the CCSS. Last night I had a deep discussion with my husband, who does not work in education, about the Common Core State Standards. He was asking about my take on them, given the frequent bad press that he has heard: that the Common Core will stick all kids in the same box, increase conformity, etc. I kind of laughed, because hasn’t that what traditional education has done all along, stuck kids in a grade level and expected them to process through whether ready or not? This whole conversation had me reflecting on what the Common Core means to me and really what I expect of myself and my students to achieve. Celina and I have always approached our work within the classroom through the lens of students first, their social-emotional needs as well as their academic needs. The 8Mathematical Practices and the 7 Capacities of a Literate Individual also speak to students first. They are pushing for the development of habits of mind that ensure all students are prepared for a world that is ever changing and are able to think critically about their experiences. For myself and my students I see the practices and capacities as the ways in which I can help all students succeed. Students who persevere in math, become students who persevere in all areas of life, those who demonstrate independent use of the skills of literacy become students who can think and act for themselves. The Whole Child blog recently had a podcast that truly spoke to this idea: "Educators need to prepare kids to be career and college ready, but they also need to prepare them for their present world. The Common Core State Standards set out to do that. They're not perfect, but they are a starting point" (Peter DeWitt). For me that means connecting with kids, recognizing that their needs are not purely academic and making choices for the classroom that support a wide variety. Working from the needs of the students, and then developing their understanding of the continuum of standards helps them to see learning as building up their foundation, something that is not solely achieved in school! 2. Common Core Standards are broad in nature and deep in focus, pushing for authentic learning experiences, as opposed to discrete skills. In order to meet the depth and breadth of the standards, Celina and I have had to rethink the purely skill focus of the past. Our classroom activities of Passion Projects and inquiry based learning have helped us to infuse the standards into learning experiences that incorporate a multitude of goals. Students no longer read non-fiction text as an isolated skill, but rather to build up their knowledge and understanding for expository writing, presentations, multi-media projects and finding evidence to support their thinking. Students authentically connect the once separate skills into a cohesive whole that helps them to express and share what they know! Our day is no longer a segmented container but a set of links and blocks that boost engagement and relevance. 3. Common Core has increased the level of rigor, not just for students but for teachers too. Achieving the goals of the Common Core means raising our level of expectations! We can no longer just accept a curriculum as the end-all-be-all, or dumb down the work for students or teachers. Building our professional capacities as educators means doing the work that the Common Core requires of our students: reading for meaning, finding evidence, thinking across the grades, boosting conceptual understanding, as well as regularly interacting with complex text and academic vocabulary. It makes me grateful that my work with Celina in creating a child centered classroom has pushed me to learn more and grow. Truly understanding that message makes me more aware of the expectations I place on my students, the growth mindset that is necessary and the goals that can be achieved through this work. With ROBOTS as our theme this year, we decided to name our standards-based grading scale in alignment with our theme! Our students have really enjoyed this metaphor. Recently our students created the rubric (in the photo above) to describe what it would look like and sound like to be OPERATIONAL as independent learners during our math block. Since our students are fluidly moving between project-based learning activities, independent goal work, partner math, and small groups, it was crucial to have our students develop a deep understanding of their expectations as learners. This rubric has provided us a platform for self-assessment, reflection, and goal-setting --- truly empowering our students as learners. A new favorite slogan of ours? "Be OPERATIONAL." Our building blocks to success have replaced our traditional "rules." Our focus is now directed to acting responsible as a learner, making personal choices to be courageous and engaged, and taking the time to focus on and celebrate the growth that is being made in our community (and selves). We begin the conversation with our students by stacking building blocks as a visual model, also relating this concept to SYSTEMS. What happens if one of these 3 is not present? The blocks will not be stable; the system will fall a part. So why is WORK HARD on the bottom? Because it is the foundation of our system. We must choose to make responsible choices on a daily basis to be a focused learner. A learner who comes to the learning community with a purpose. A learner who has the mindset of participating and choosing to be engaged each and every moment. BE COURAGEOUS is our middle block because it is what truly makes the difference for us as successful learners. It holds the hard work and celebration together, as without having a growth mindset to endure challenges it is easy to give up. CELEBRATE GROWTH is the top block, as it represents the goals we are trying to reach. It reminds us that moments of celebration are necessary and should be a part of our community. We must take the time to recognize the success of each other through the learning process. And as one of our students mentioned, "By taking the time to celebrate the goals we accomplish we just want to learn more and more and more!" This year our students recognized PERSEVERANCE as the overall theme of these building blocks, as well. 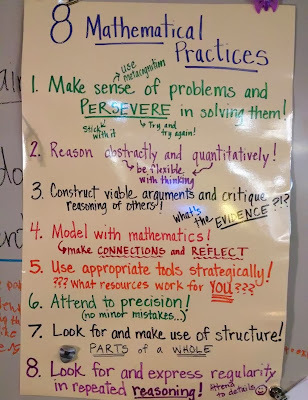 As we focus directly on the 8 Mathematical Practices, Capacities of a Learner, and Habits of the Mind, we are currently making genuine connections to where perseverance applies in our daily life. Our students instantly noticed that perseverance was a key ingredient deep within each of the blocks. Our shift in thinking from such an intent focus on "following the rules" to "being an engaged/dedicated learner" has truly made all the difference. We have had a higher rate of focus, participation, and excitement. Through this perspective we are able to build a community within our classroom more quickly, establish a solid foundation for our learning environment, and offer challenges more readily. But more than anything, these blocks provide our students with a clear purpose when they walk into their learning space. They know the expectations are high, but we offer them an environment for individuality to shine, and a safe space for risks and challenges to exist because we will celebrate each other every step of the way together. Ann and I start the school year now from a completely different perspective: We are facilitators in a student-centered classroom. Sure we can choose our color scheme (blue, black, and silver! 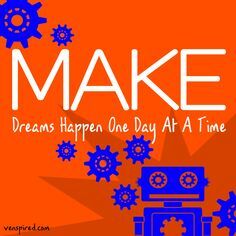 ), our concept of focus (SYSTEMS), our theme (Robots), and even a slogan ("Gearing up to learn...Sparks will fly!"). But those are just things we choose in the hopes that we will inspire our students from the moment they walk into their learning space. Preparing anything beyond that is nearly impossible. Something wasn't feeling right as we approached the first day this school year, and we finally we realized what is was: our kids were missing! Then I was reading some of my favorite blogs the day before school started and came across a post by Pernille Ripp. She too was feeling the same way me and Ann were. In a student-centered classroom, you can only prepare so much for the first day of school; and the second day, and the third, and the fourth... for that matter. The students drive our decision making on a daily basis. In order to know the direction we will go, to make our lesson plans definite, to decide on specific materials and strategies, our kids must be present. We must have countless opportunities to get to know their personalities, their strengths, their challenges, their interests and their ambitions. And as if it was meant to be, I came across the poster above created by Krissy Venosdale. It put everything I have expressed and felt into very simple terms. As educators with a student-centered mindset, we focus on one day at a time. And everything we do is built on the premise of truly making dreams come true. Here's to all the classrooms that whisper "you complete me" to students as they enter each day. Celina, as usual, inspired me to jump on the blog and reflect on what I have read so far this summer. So far my Kindle has been my go to resource for reading, as I can stay up and read as late as I like without complaints! 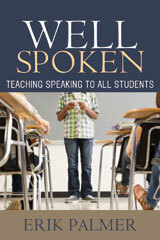 My first read was the book Well Spoken by Erik Palmer about teaching speaking to all students. This book caught my eye when I was researching the CCSS in speaking and listening anticipating where we will be going in the fall with our next shift in instruction. Our kids have done a lot of speaking this year, as we chose to work with what they are really good at: TALKING! We consciously focused on teaching our students how to turn & talk effectively. I quickly noticed a transformation in the way kids communicated with each other. Conversations were more purposeful and students began to add on to their partner's thinking as opposed to simply telling their one-sided point of view. We used more debate in our classroom, as well as building on our work with Arts Impact to help students more effectively express themselves in character. Well Spoken is about teaching speaking skills and so much more, making it highly relevant for the 21st century classroom. Several things that stuck with me: Effective communication requires building and performing, not unlike reading, writing and skills in math. Speaking requires being mindful of audience, content, organization, using visuals effectively and the way in which you present yourself. We work on many of these same skills in writing, building effective beginnings and endings, organizing our writing to explain or entertain and viewing our work through the lens of what makes writing interesting to read. When we presented our Passion Projects throughout the year, students also had the opportunity to use visuals and presentation skills, yet from reading Well Spoken I can see some areas where we can help our students to more effectively share their message. Palmer also suggests 6 Traits of effective speaking, otherwise knows as PVLEGS or Poise, Voice, Life, Eye Contact, Gestures and Speed. I saw many connections between these performance needs and building fluency in oral reading, such as expression (Life) and pacing related to what you are reading for effect (Speed). I can't wait to use these ideas to effectively draw our students into effective communication, not only with speaking but also listening actively for these traits, writing clearly in building essays and speeches, as well as reading with expression and fluency. When the work connects across more areas, I see my students finding greater relevance in the learning and more meaning in the strategies and ideas. Plus I love finding ways to prepare my students for the uncertain future, as Palmer says, "Now, let me make a radical statement: the mission of education should not be to make students better at school but rather to prepare them for life." My second read was Who Owns the Learning? Preparing Students for Success in the Digital Age by Alan November, a recommendation I found via Twitter. Summer brings about many things for me, one in particular being a summer reading list. I have been an avid reader since I was a kid, which is probably when the expansive book lists began. One thing I have learned in my lifetime is that when you love books, reading lists are forever growing and never shrinking! I am a balanced reader between fiction and non-fiction, and plan to blog about books that inspire me as I reflect on the past year of teaching, learning, and growing and establish goals for the upcoming school year. The Net-Generation, more than any other, will be coteachers in the classroom. (pg.31) Ann and I have dynamically shifted our practice to involve our students in every aspect of the teaching and learning process. Students increase their memory by being a part of the discovery process and are courageous when researching information that meets their individual goals. Providing opportunities for them to teach others enhances their learning and makes information relevant. I really appreciated the term "coteachers" being used in this statement! Students can both learn and teach in this world. Education is available everywhere. (pg.43) ...well isn't that the truth! Adapting this mindset is the first step in providing opportunities for our students to learn and teach globally. Education no longer has to be confined to the walls of the classroom, or the building. Rather there are a plethora of tools, resources, sites, etc. that spark communication among students around the world. Imagine the possibilites! Brains learn best when working with other brains. (pg.50) Ann and I both had professional goals in the area of speaking & listening this year. Pushing ourselves in this realm of literacy enabled our students to authentically communicate with each other. Their dialogue, silent signals, debating skills, and sharing of creative ideas added another dimension to learning within our classroom. Your job as knowledge keeper is obsolete. (pg. 69) In the beginning years of my teaching career this was a hard concept for me to grasp. My college experience prepared me as the keeper of knowledge and how to share this knowledge with my students. Technology has advanced at such an immense rate, it was difficult to shift my thinking and become comfortable with how accessible information is these days. However, it has relieved the pressures of having to feel as though I had to play that role. Instead I bask in the glory of teaching my students how to be learners in the world we live in and navigate the infinite information at our finger tips. How cool is that?!? Memories make us smarter and give us the tools to be creative, to synthesize, and to build relationships. These are 21st century skills that our students need to succeed. (pg.125) Everyday as a learner should be full of enriching experiences. These experiences allow us to view the world from different angles, sparking creativity. These experiences help us to be able to make genuine connections and deeply synthesize concepts. These experiences provide opportunities to engage in conversations with other and problem solve together, building natural relationships. Enriching experiences should be a part of our learning environment to build these skills that our students so desperately need. 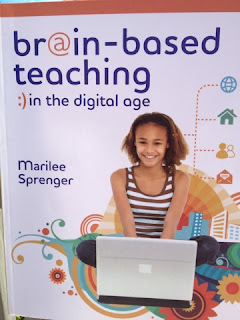 At heart, I am a brain-based educator. It is important to me to teach students about their brain and how we gather information through experiences and novelty, sparking creative juices along the way. It is important to me to provide ample opportunity for my students to reflect during their learning journey and solidify the information they have encountered and establish goals to continue mapping their learning path. I want my students to be a part of the learning process, every step of the way; a navigator, rather than a tourist. Sprenger's book helped me confirm my teaching philosophy and provided me with more strategies to strengthen my teaching skills, as a facilitator of the learning process. Shift #2: Teach Less, Learn More! The reflections recorded on this blog are not meant to express the opinion of our employer or colleagues. The ideas posted are intended to capture moments, thoughts, and perspectives in time to aid in our own personal growth, and hopefully support the professional growth of our readers. Wellness isn’t about deprivation and it’s not about perfection. It is about pointing yourself in the direction of growth, training yourself to get comfortable with your highest potential, and then taking small steps to support that shift. It’s about showing up for yourself, day by day, and then one day finding that you’ve undergone a transformation. Brennan & Ottmar. 2011. Simple theme. Theme images by luoman. Powered by Blogger.